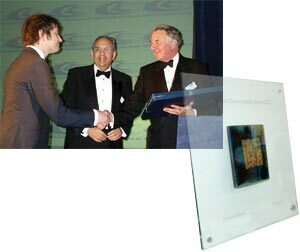 The winners of this year’s Electronic Business Transformation Award (eBTA) ‘Oscars’ - run by Charteris in conjunction with the IoD (Institute of Directors) and Microsoft - were announced on Wednesday November 27th 2002 at an awards dinner held at the IoD on Pall Mall. Now in its third year, the e-Business Transformation Awards (the eBTAs) are an annual award scheme which spotlights excellence in e-business. The eBTAs were created to recognise those organisations which were genuinely improving business performance by developing and implementing e-business initiatives. Other companys at the awards include: Cable & Wireless, Dabs, beprofessional.com & British Gas.